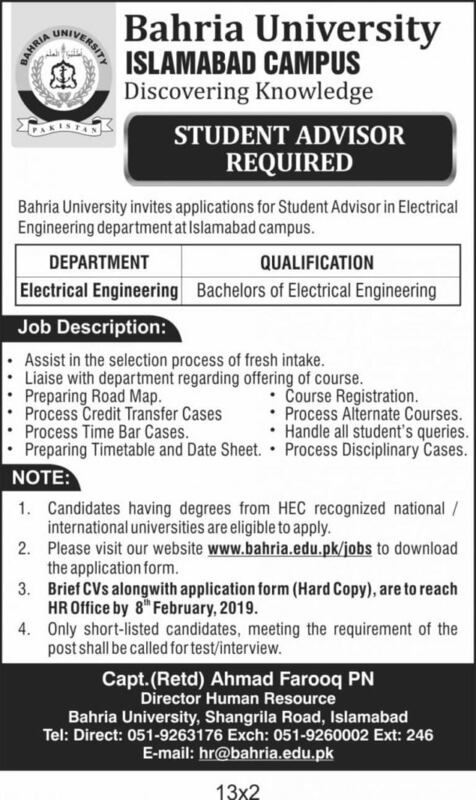 Student Advisor is Required in Bahria University Islamabad. Assist in the selection process of fresh intake. Liaise with the department regarding the offering of course. Preparing Timetable and Date Sheet. 1. Candidates having degrees from HEC recognized national/international universities are eligible to apply. 2. Visit Bahria University website www.bahria.edu.pk to download the application form. 3. Brief CVs along with application form (Hard Copy) is to reach the HR Office. 4. Only short-listed candidates, meeting the requirement of the post shall be called for test/interview. Last Date to Apply for Student Advisor Post in Bahria University Islamabad 8-February-2019. View Jobs in Bahria University for Research and Development Posts.